Warhammer 40,000 (40K) is a very iconic tabletop game, both with its gameplay and its unique art style. 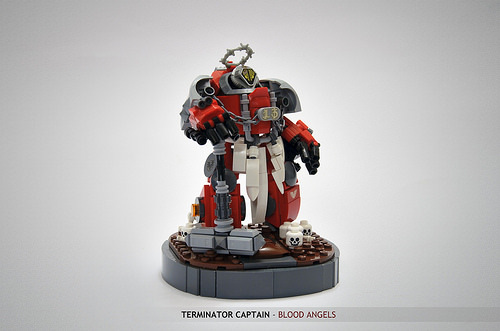 Said art style has inspired many builders to create LEGO Warhammer models, most recently Faber Mandragore with his Blood Angels Captain In Terminator Armour build. The chunky mecha and monsters with oversized weapons and edgy elements are just charming in a twisted way. The builder has captured the feel of this style perfectly, even adding a little base much like the original figures. Various curves are achieved using all sorts of curved pieces – including car hood elements as oversized shoulderpads. I really like the hammer construction using gray ingot parts and the use of the U.F.O. alien helmet as the head. 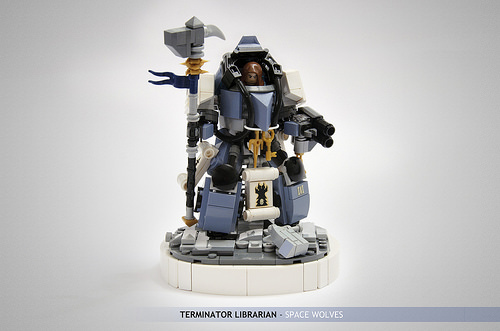 Faber has also shared an armored Rune Priest, so perhaps we can look forward to a whole series of LEGO Warhammer units and character classes. Thanks for the review is absolutely welcome, as written below there will be other models!